FELIX GLUER from LYNX Poland is a state-of-the-art solution for precise dispensing of both hot melt and cold glues – a CNC controlled glue dispensing machine. The machine is universal and versatile, dedicated for the packaging and POS manufacturing industries. What sets it apart from standard gluers is the ability to simultaneously apply glue to a few elements that differ in shape. 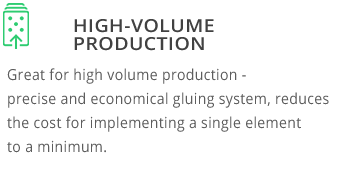 Glue is applied with high speed and precision; the amount of glue is identical along the entire application length. The work area of the machine is divided into two independent moving work shelves. This facilitates the application of the adhesive to two elements that vary in thickness, at the same time. 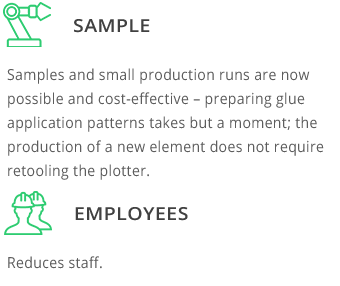 The plotter makes production faster by determining work cycles for the operator and eliminating time waste typical to manual application of glue. HOW DOES THE PLOTTER WORK? Prepare your design, mark with different colours paths for hot and cold glue. Place a pile of elements cardboard (or other) on the plotter. Start glue dispensing process. After all glue paths are applied to an element or a group of elements, the glue head moves to the standby position and remain there for the chosen amount of time, to give the operator a chance to remove element/elements covered with glue. The plotter automatically raise the pile of elements up by the thickness of the removed element/elements. The glue application process will start over again. One, two or four independent, automatic, moving tables. Each of the table can be divided into any number of glue dispensing zones. Since each section moves independently, you can simultaneously apply glue to two types of cardboard (or other material) that differ in thickness. All tables are equipped with positioning devices. Tables in one machine can work separately, or together, as one table. The FELIX Gluer is a universal solution that can serve many industries. LYNX Gluer – it is an intuitive CAD-CAM software for designing glue patterns and machine steerage. Both steps: preparation of the project and plotter control is done in the same software window. It makes machine operation fast and errorless. LYNX Gluer enables advanced object design facilitates an easy creation of user defined projects (from simple lines and geometric shapes, to more complex patterns) but also enables uploading projects saved in CAD formats (e.g. DXF) in external software, thus making life easier for companies who already use other software for determining glue application patterns. LYNX is a modern manufacturing company that has been developing CNC machines for over 10 years. We are the only company in Poland that manufactures glue dispensers that utilize 100% proprietary solutions – from design, through control, to proprietary CAD/CAM/CNC software.